On Monday evening, a Canadian research helicopter in northwest Nunavut crashed into the Arctic Ocean. Three men from the CGCS Amundsen research vessel were on board, examining the sea ice from above to determine the best route for the ship to take. All three were killed in the crash: climate scientist Klaus Hochheim, commanding officer Marc Thibault, and pilot Daniel Dubé. The Amundsen recovered the bodies, which will be entrusted to the RCMP as soon as the ship reaches land. The helicopter remains at the bottom of the Arctic Ocean (~400 m deep); until it can be retrieved, the cause of the crash will remain unknown. During my first two years of university, I worked on and off in the same lab as Klaus. He was often in the field, and I was often rushing off to class, so we only spoke a few times. He was very friendly and energetic, and I regret not getting to know him better. My thoughts are with the families, friends, and close colleagues of these three men, who have far more to mourn than I do. Perhaps some solace can be found in the thought that they died doing what they loved best. All of the Arctic scientists I know are incredibly passionate about their field work: bring them down south for too long, and they start itching to get back on the ship. In the modern day, field scientists are perhaps the closest thing we have to explorers. Such a demanding job comes with immense personal and societal rewards, but also with risks. These events remind me of another team of explorers that died while pursuing their calling, at the opposite pole and over a hundred years ago: the Antarctic expedition of 1912 led by Robert Falcon Scott. 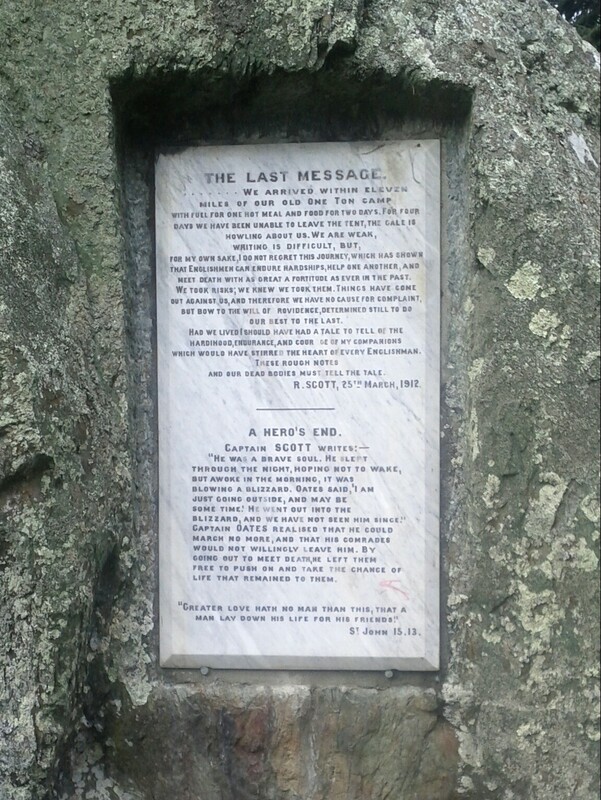 While I was travelling in New Zealand, I visited the Scott Memorial in the Queenstown public gardens. Carved into a stone tablet and set into the side of a boulder is an excerpt from Scott’s last diary entry. I thought the words were relevant to Monday night’s tragedy, so I have reproduced them below. We arrived within eleven miles of our old One Ton camp with fuel for one hot meal and food for two days. For four days we have been unable to leave the tent, the gale is howling about us. We are weak, writing is difficult, but, for my own sake, I do not regret this journey, which has shown that Englishmen can endure hardships, help one another, and meet death with as great a fortitude as ever in the past. We took risks; we knew we took them. Things have come out against us, and therefore we have no cause for complaint, but bow to the will of providence, determined still to do our best to the last. Had we lived I should have had a tale to tell of the hardihood, endurance, and courage of my companions which would have stirred the heart of every Englishman. These rough notes and our dead bodies must tell the tale.